Sorry, all. I’ve been spending more time painting, and less time blogging. I’ve been and will be, following you and enjoying your blogs in bursts. I’m slow, but I’ll get there:) I’m also posting my nature photography on Instagram, so click the sidebar photo if you’re interested. As always, I very much appreciate your “likes” and thoughtful comments. Thank you! Just a brief pause to think about the how to face the emotional breakdowns that life sets before us. And life rarely falls down on the job. A strong and captivating portrait of a young lady. Beautiful. Hi Elena, I am glad to come across your blog. you got talents, do you take orders? Thank you, Alex! Yes, I take on commissioned portraits. I insist on taking the photos however, unless the individual has passed and there is an excellent reference photo. Right? :) You do the same, and I’ll be looking for your newest as well. Thank you Rita! The more I look at this painting, the more it fascinates me Elena. The highlights on the girl’s face, the shadows cast by her legs on the wooden surface — absolutely splendid work. Take your own time with blogging Elena, but do continue painting and creating these fabulous works of art. We will wait. The pose and her expression are beautiful! We have to do what calls us most 🙂 Your painting is very beautiful! The facial expression is brilliant. Fabulous! Your talent is unique & outstanding! Emotionally powerful piece, Elena. I suspect D in dots is torn between something, and not just which sock to choose – her mind appears to be grinding away. It surely is. Thanks ever so much, James. Always hard to balance the time with a a young family. Hope you are able to get to work soon. Thank you, Patsy! Thank you, Elena. This is, from the quality of your work, what I thought you would say. Unfortunately you have answered my question. I cannot think of a better portraitist. That’s so very kind of you, Derrick. Thanks so very much. I’m always interested in the poses you choose for your sitters and the extent to which they express character. This was a natural pose when I asked my lovely model to sit. Always best to have enjoy such a collaboration. Thank you, Louis. There is much more to this than representation. 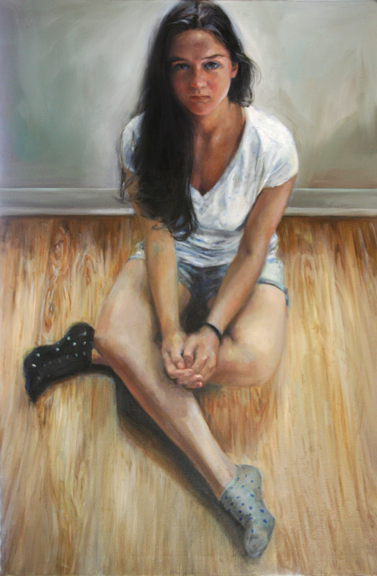 I love the way the woodgrain of the floor intensifies the closer it comes to the skirting-board; I love the way the grey of the wall intensifies the further away it goes from the young woman’s head, with the result that she has a subtle aura. These are attention-grabbing. The centre of the painting is the young woman’s lower body – the woodgrain focuses that – but that centre is enclosed and in shadow. The ‘aura’ draws us back to her face and makes us confront a personality. There’s much, much more. Oh, how I love your particular way with words, Marie. I humbly thank you for every one. As I love your way with the brush. Love this. The pose is excellent. The face tells a story in itself. If I was a writer (lol) I’d say that this young lady is thinking about a recent incident. Whatever happened has made her think carefully about her next move. Love is involved. Trust is involved. The promise of tomorrow is in the balance. Thank you for mentioning your nature photos. I don’t follow Instagram and those are really a treat to look at. Beautiful painting also 🙂 I have to say though, the work you did on the floor in the background is probably my favorite part. I love your eye for detail. Thanks so much, Allyson! I always look forward to your comments. I’m pleased that you like my creature photos. They’re an amateur passion for me. Don’t apologize! It’s a treat to see your paintings, whenever you post them. The pose is a difficult one: it’s difficult to get the legs right when they are folded like that, but you’ve managed very well. Funny, the legs worked right off. It’s the floor that make me bonkers:) Thanks so much, Mrs. D.
I’ll try to remember the as and when-love it! :) Thank you, Tom! So good to see your great work continuing Elena. It’s the work that counts and when blogging becomes work well . . . . time out! True, Patti. Right now, the work takes priority. So lovely and real … love your work so much. Great painting. Lovely. I particularly like the floor. It enhances the depth and solidity. Many thanks for sharing. Many thanks for you kind comment, Maria. Oh , but should no apologize , dear Elena. You create exceptional paintings, this is very important!! I am very happy to admire them! Thank you so much for sharing with us. No need to apologise! Nice to see your wonderful work again instead. Wow such a beautiful painting. You’re really such an artist. Thanks for sharing this. No, I not the multi-tasker:) Thank so much for your vote of support!